Hola Cottage Fix friends! So I’ve been happily trucking along with my decorating endeavors, and also thinking a lot about white paint. If you’ve been following along then you know I recently painted our sun porch a soft white and filled it with white wicker and an heirloom bench. I’m totally diggin’ the fresh feel of that room and I guess I’m sort of stuck on bringing more of that feel into the rest of our cottage. You know when you get an idea stuck in your head and it just plants itself there and starts to take root, maybe even making you twitch every now and then. Sometimes you just have to get it out of your system! Here we go… white paint! Enter Sherwin Williams Dover White. 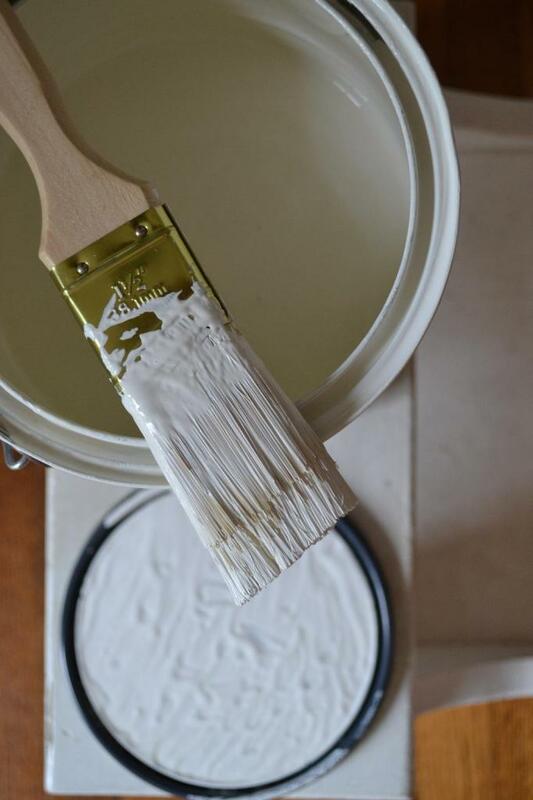 Picking a shade of white is the worst — they all start to look the same! Do you want warm undertones or cool undertones? Are you trying to pull a fabric color? I don’t know! I’m trying to get that nice fresh feel like I got in the sun porch. So I’m starting in with Dover White in the family room – I don’t think I’ve ever shared my family room before. There’s a reason and hopefully I’ll be changing that. 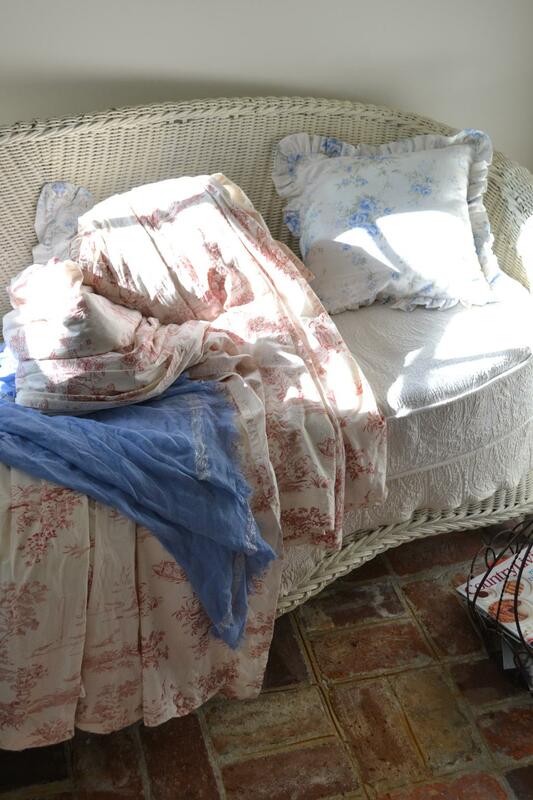 The overstuffed chairs are so comfy, but they don’t exactly go with the room or with each other for that matter, or even the rest of our little cottage. The striped one is a hand me down and the floral one with the matching ottoman is from a yard sale. Man I thought I was hot stuff when I brought that floral number home. Grin! 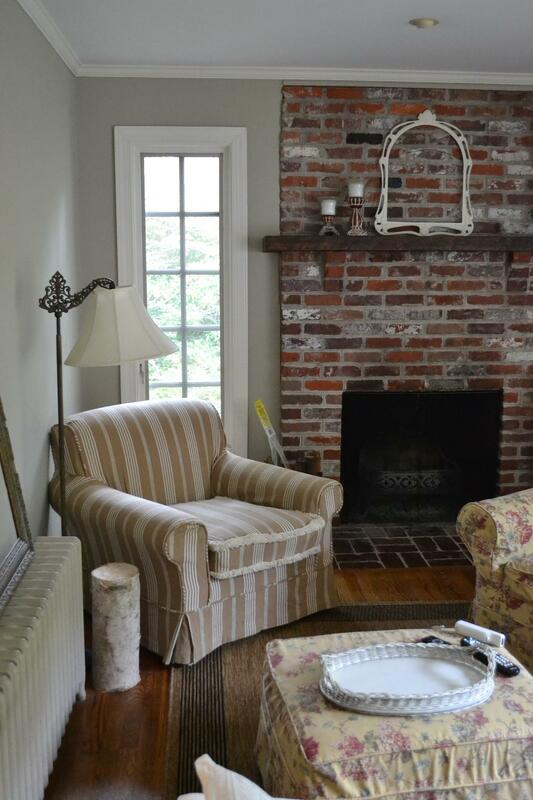 Our family room has some nice features like a wood burning fireplace, large windows, and beautiful afternoon light. It’s just a little tired and in need of some freshening up. I’ve finished with two coats of Dover White on two walls and still have two walls to go. These are the red and cream toile drapes from our family room, I’m getting a new rod to hang them that ties in to the wood tones of the mantle. I piled the panels up on the sun porch while I’m painting and I’m really enjoying the color combo of the bright blue with the red and cream. 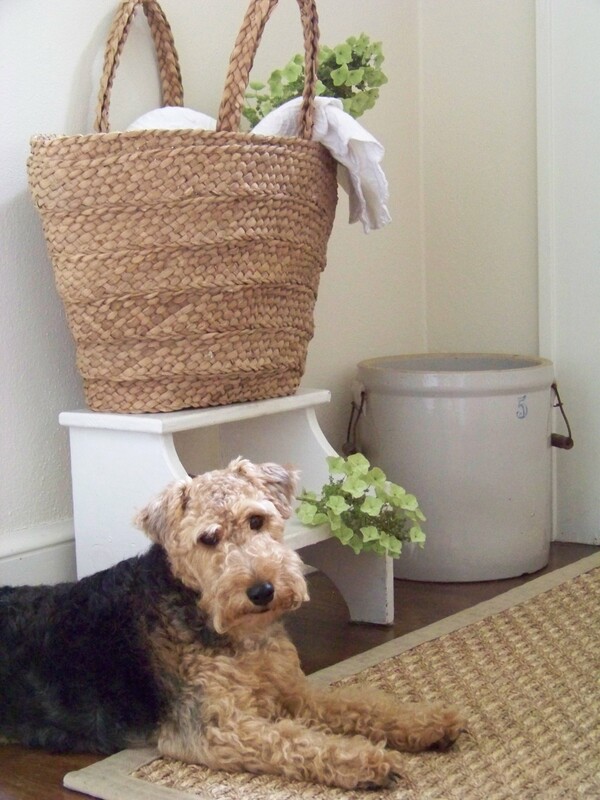 The whole cottage is in disarray when I’m painting—there’s no way around that I’m afraid. I might bring more of this color palette in so if your not a fan of bright color schemes please look away from your screen now! So I’ve been teetering back and forth on the white painted walls and this passage on the back of the Dover White swatch from Sherwin Williams gave me the courage to move forward. And it is only paint after all, glorious white paint! Use white wisely. Time to stop thinking about white as a default and more as the dynamic color that it is. Consider its undertones. For warmth, choose whites with yellow in them. For that sleek, cool feel, go with blue undertones. No matter what, using whites will expand the sense of space, and it’s the one shade that at allows you to create looks that are both classic and contemporary at once. It’s those last couple of points that won me over: expand the space and a classic look. 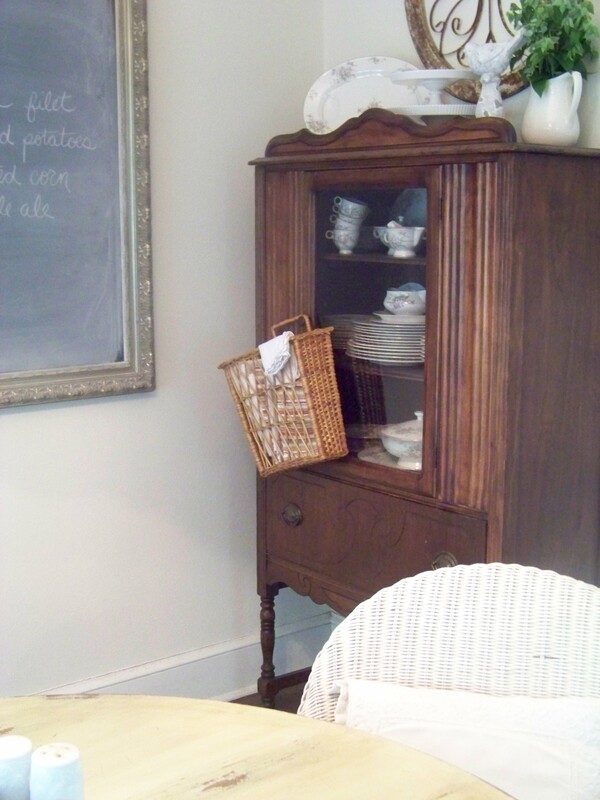 This entry was posted in cottage makeovers and tagged color, paint, warm whites on October 22, 2014 by sally. I envision an English cottage vibe in your family room. The over stuffed floral chair and ottoman, the toile curtains, wooden floors and that beautiful wall color are sooooooo cozy. (Hey, even the color name is British.) Maybe a little wicker stool next to the chair for a cup of tea and you are ready to enjoy the chilly fall evenings by the fireplace. Thanks for the chance to visit your family room. I can’t wait to see how you will be decorating for the holidays. Wow, your family room is really a pretty room! 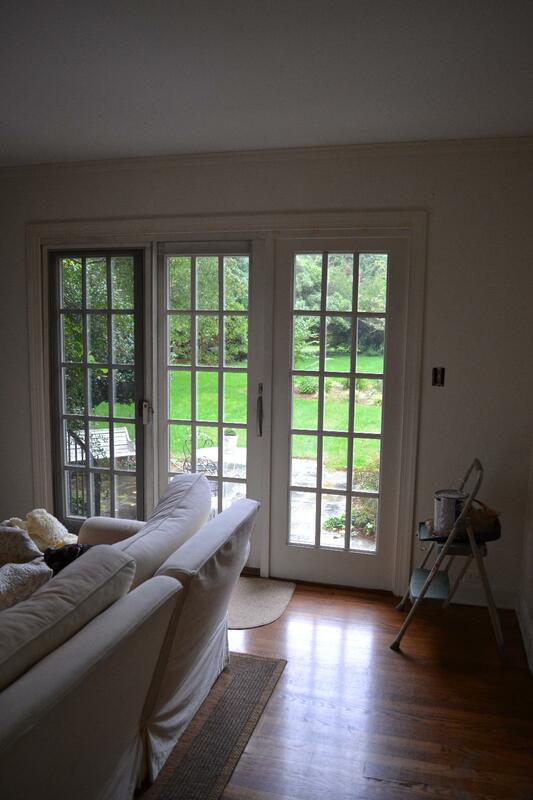 We painted our little townhouse white too–white walls, woodwork, and new 6-panel wood doors, painted white too. White can be tricky, though. I used the same color throughout, and it definitely looks different downstairs where we don’t have as much direct sunlight. But I do love it, and in such a small place, it really makes it look uncluttered and clean. Love the color tone of the white paint you chose. Looks inviting! Oh I think your going to like your new white walls very much! I painted my living room/dinning room and kitchen the same color of creamy white a few years back and I still love it. I think what I like most about it is the way the color I put in the room really pop out at you. It makes changing things up really easy. Love that fireplace you have and the chairs do look comfy – – I’m sure you’ve thought of slip-covering them to make them work with your room. Maybe before you get to that a big piece of white fabric, lace or blanket could work right away to help you figure out what direction you want to go. You’re going to have your family room looking as charming and cozy as your sunroom. 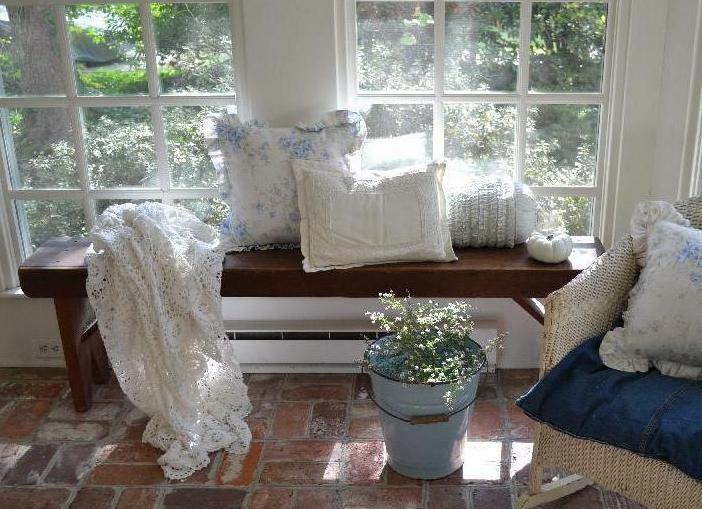 White seems to be perfect for your darling cottage…love the way you add florals and soft colors when you accessorize. I really like your chairs, Sally. I think they’re charming and they do have an English cottage look. I love the red toile/blue combo too. Looking forward to seeing your finished room! Oh you won’t be disappointed with your white walls. Almost all of mine are white. I used Linen White from Benjamin Moore and have never looked back.